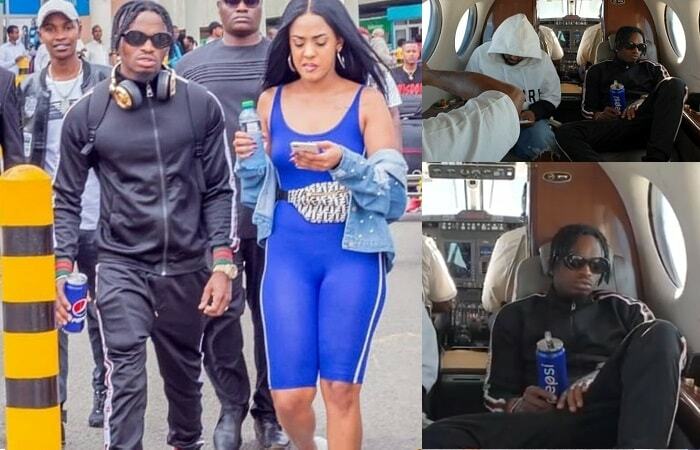 The Tanzania Bongo star Diamond Platnumz jetted into Kenya this evening on a private plane and he was received by his latest Kenyan lover, Tanasha Donna. Platnumz and Donna looked smitten going by the pics, the fans were happy for them. He will be performing in Thika tonight at the Game Tosha launch and tomorrow, he will be back in Morogoro, TZ, to continue with the Wasafi Festival tour in Mombasa, Nairobi, Mwanza and Zanzibar among others. Diamond Platnumz was in the company of his manager, Sallam, official DJ Romy Jones and his security detail. 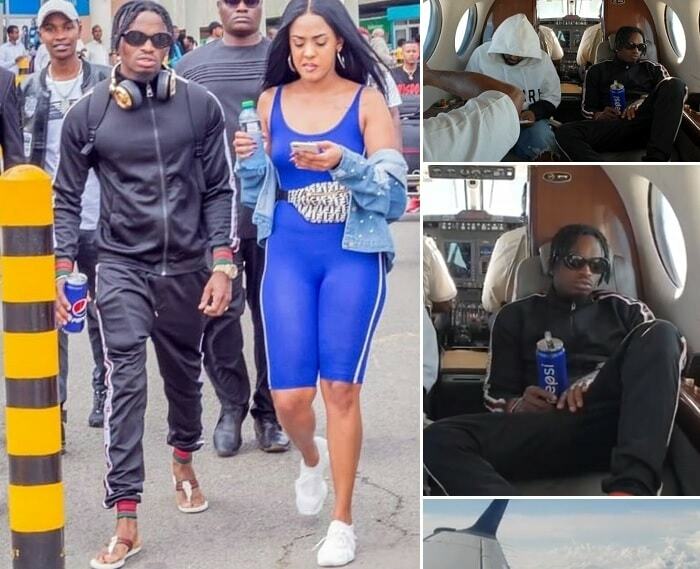 Platnumz was clad in a black Tracksuit while the Wasafi First Lady was in blue and a denim jacket on white sneakers, it was like she was from working out. The two headed to his hotel room to freshen up for tonight's show. Diamond introduced his new lover to his fans a few days back saying that her beauty cannot be missed even from her shadow. The two were hanging on a beach in Tanzania last weekend where the singer poured out his heart in a sand I Love You message. Not long back, Platnumz was spotted with Kim Nana, but looks like they could not ride on the same horse. The fans have since been congratulating him on replacing Zari and back in Uganda, his manager was asking the fans how Donna was over Zari, but most responses seemed to suggest that Zari was irreplaceable, they also did not forget to remind him if he was on a mission to have a lover in all the East African countries. The fans are happy for Diamond though, considering, that this year has been a bumpy one after Zari Hassan dumped him because of his closeness to Wema Sepetu and yet Hamisa Mobetto was on the sides too, but in November, the singer officially told his fans that he was in love and the lucky one is none other than, Tanasha Donna Oketch, a radio personality who is half Italian and Kenyan.